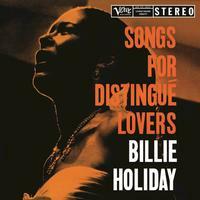 "Songs for Distingué Lovers" is an album by jazz singer Billie Holiday released in 1957 on Verve Records. It was originally available in both mono, catalogue number MGV 8257, and stereo, catalog number MGVS 6021. It was recorded at Capitol Studios in Los Angeles from January 3 to January 9, 1957, and produced by Norman Granz.